Each year, UT hosts a week of events showcasing independent research done by undergraduate and graduate students across departments. This year, TARL was proud to support several of our student interns and volunteers as they presented their research projects. TARL students Elizabeth Coggeshall, Jenny Levin, and Sheldon Smith presented their independent research at UT Research Week. 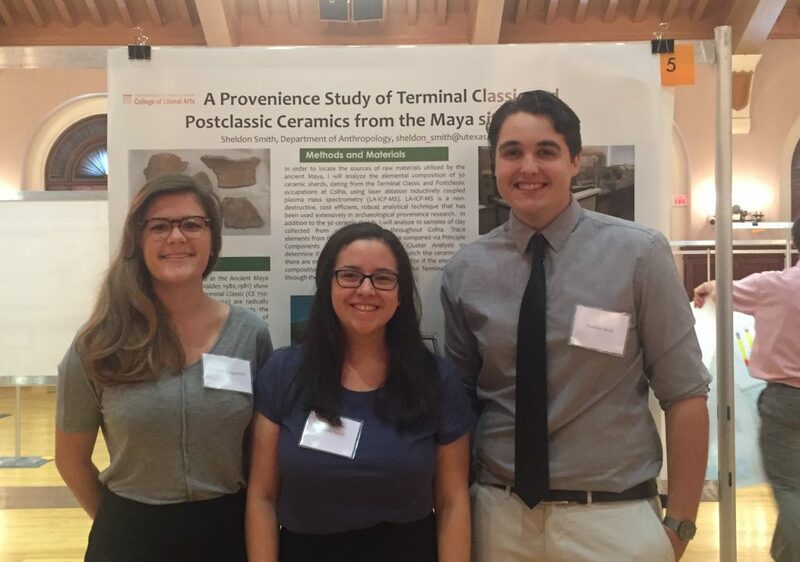 Former TARL collections intern Sheldon Smith presented his archeological work on ceramic raw material sourcing at the Maya site of Colha, which he hopes to complete this summer during the Programme for Belize field season. Current TARL Human Osteology Lab intern Elizabeth Coggeshall presented on her primate gut microbe research, which she has conducted in collaboration with various other labs. And, TARL volunteer and anthropology/ history double major Jenny Levin demonstrated the power of technology to enhance our understanding of the past as she explained her work creating a website that compiles the layers of UT’s history into an interactive experience. We are extremely proud of these great students and we know they’ll go on to great things in the future! TARL also hosted a table at the Longhorn Research Bazaar, where we gave out information on research opportunities we offer for students. TARL is always looking for students who are interested in conducting independent research at the graduate or undergraduate level–our collections and library are available to you! TARL collections can be used for senior theses, master’s theses, doctoral dissertations, independent studies, and much more. Contact us to begin exploring opportunities.